I've had my eye on Zoë Marriott's second novel, Daughter of the Flames, since I read Chelle's review lo these many months ago. So I was happy to see it pop up on my Cybils reading list. 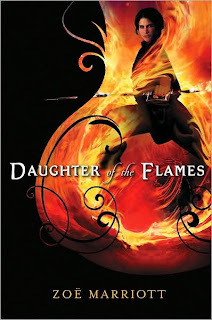 I've read several books lately that have had an Asian/Middle Eastern flavor to them and was surprised and very much pleased to find Daughter of the Flames did as well. This was my first novel by Ms. Marriott and I was both looking forward to giving a new author a shot and in the mood for some more traditional fantasy. It's also worth it to point out the rather lovely cover this novel sports. The flames and curlicues are swirlingly lovely, enough so that the fact that Zira doesn't look quite as I pictured her isn't any kind of stumbling block at all. Zira is a trained warrior. A novice with a face full of scars and a forgotten past, she perches right on the cusp of her sixteenth birthday. At the same time she anxiously awaits her superior's decision on whether she will join the ranks of the namoa or be sent to tend the temple livestock for the rest of her days. Born a Rua, Zira belongs to a conquered people. The Sedorne rulers overran the peaceful country of Ruan and the current king, Abheron, rules with an iron fist, encouraging his lords to crush the Rua under their feet. But behind the deceptively peaceful temple walls, rebellion is in the wind. When a surprising series of events lead Zira to save a young Sedorne lord's life, she is set on the path that will lead her to places she never expected, where, frankly, she would rather die than set foot. But it is Zira's fate to be more than she is, to combine the hopes and fears of two races in one body, and to be savior to a nation. I was drawn in very quickly. There are all kinds of familiar fantasy elements at play here that Marriott handled quite well, wrapping them up in a nice bit of world building, full of heady descriptions of cuisine, vegetation, and light and shadow that had me salivating and oohing and ahhing at will. Zira's past is appropriately murky and, when it comes to light, it is in no way surprising. And yet Ms. Marriott weaves in some interesting implications that keep you reading. The same is true of the villain. He is dastardly and despicable and, after one particularly grisly scene, I was convinced he was truly evil. But he wasn't surprising or very complex, really, until about 250 pages in when his character development takes a truly masterful turn. Literally between the space of one page and the next I was fully invested, desperate to see how these heretofore unknown layers worked their way into the plot to wreak havoc. Unfortunately, this was a bit too late as there were only about 80 pages left in the book. If only he'd become more interesting 100 pages earlier. Because this book has a truly excellent climax, full of fighting and mayhem and excitement. The romance followed the same lines. I loved how unconventional it was, how it was all arranged as a matter of strategy and convenience and whether or not they might actually be capable of falling in love with each other was considered of only minimal importance. This slow pace was delicious and I bought their hesitance and awkwardness and loved every minute. But things began to fall apart at a certain point and I felt like this central relationship never quite got back its former fervor by the time the story wound to a close. Despite these inconsistencies, there is some real talent here and I will definitely be picking up Ms. Marriott's next book. Sounds great, too. But OMG, COVERWANT. Srsly, why does everyone ELSE get covers where their characters are actually USING weapons? Arya, I hope so! Let me know if you give it a shot. Happy Holidays! I read Marriott's first book, THE SWAN KINGDOM, and wasn't super impressed, but FLAMES' plot sounds great so I'll pick it up soon! This one sounds really good, and even though I don't need any more books on my TBR list, I'm going to have to add it. Seriously, I was trying so hard to keep the list under 400, and it can't be done. The descriptive passages really hooked me when I was reading this one. I enjoyed the romance, though like you I had a few issues with it. I was intrigued to learn that Marriott has a sequel of sorts in the work (on her site: "will take place several years after after Sorin and Zira come to power, and will be set in the mountains where Zira grew up. Fans of Daughter of the Flames will probably like it a lot (although Zira and Sorin will only make guest appearances) because the story is going to be stuffed with battles, fights and other such mayhem." I'll definitely have to pick that one up.